This week, Christy, a long time follower and reader of A Tray of Bliss, shared with me that she has chosen Adele, as her role model for our task for 2018. She feels that she is a similar body shape and height to Adele, and that emulating her style is an achievable goal. Adele is a great choice. 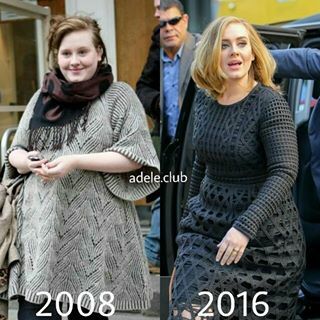 Now Adele, back in 2008, as seen above, was a pretty girl with beautiful skin and hair, but once she was in the public eye regulary...wowsers! She became a stunner. And surprisingly, I believe it has less to do with weight loss (despite what everyone thinks), and more to do with just simply finding what suits her body shape including hairstyle and accessories, and some clever makeup tricks! I've known, as someone with a full face, that pixie cuts and flat hair....well...we just don't do well together. Pixie cuts with a fringe (bangs)....never. The flat hair and the low fringe (bangs) just make a round face look rounder. Sure it's easy, sure it's cute. So if you just want 'cute and easy', no worries! But if you're looking for 'flattering', then look at the difference a long ponytail seen left, or a 1940s, glamorous, Jean Harlow sort of style, seen in the middle pic below, achieved really simply with heated rollers, can do. And if you're after cute and easy, then practice as I've learned, mastering the messy bun on top of your head, a French chignon, or a low ponytail with a bit of teasing at the crown, to give a look as seen in pic number three, adding height to your frame, and sophistication to your ensemble. Here's Dame Judi Dench with her rounder face and a pixie cut. Check the small nuances. She has a bit of texture, softness and height. She does not have a fringe (bangs), except for a bit of a tufty feature centre front of her hairline. These two things make her face look longer and slimmer, and expose her beautiful bone structure and fine features. 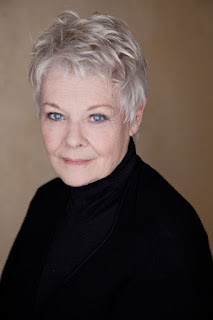 She has a uniform colour to reflect light and draw attention to her piercing blue eyes. And she makes sure her makeup is also soft and flattering. Looking again at the comparison between these two pictures, what else do you notice? The eyebrows are more defined and arched. This draws attention to the eyes, and overall gives the illusion of more open eyes and a longer face. The eyeliner is limited to a winged effect on the top of the lashes, and a mere hint under the eye. 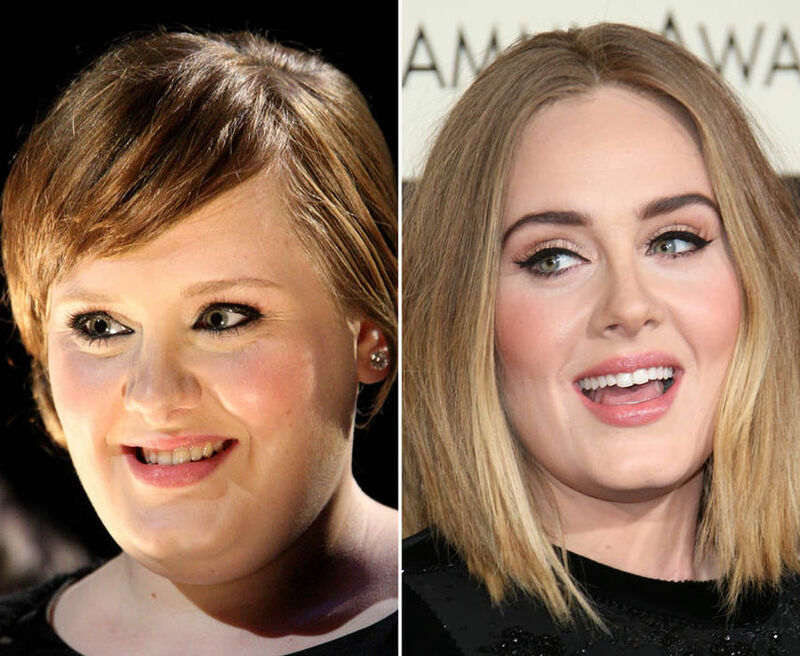 Previously, Adeles eyes were made to look smaller with a ring of eyeliner all the way around. Her browbone has been highlighted to open the eye area as well, and there's a little contouring going on beneath the cheekbones and around the jawline. Contouring is not new. We were sucking in our cheeks and filling the space with darker blush back in the 70s! The hair is longer in the second shot, giving a similar column effect to wearing a coat over a dress for we Apple shaped ladies. The additional length of the bob cut, gives a column of attention, framing her face and making it look slimmer. Her lighter hair colour is so much more flattering and draws attention to her gorgeous face and eyes. These are all really simple things that any of us can achieve. Yet look at the difference they can make! No secret. About 14 rollers and 15 minutes to achieve. If I can do it, so can you. I roll my hair, hop in the shower, and by the time I've dried off, they've cooled enough to be taken out. I don't even brush. I just put a bit of hairspray on my palms, and run my fingers through my hair to arrange it, then a light spray of hairspray over. I pin it back inconspicuously where required to get the front to sit right if necessary. Another great photo photo secret, is to simply remember to kind of push your head forward, lift your chin, and tilt your head slightly to one side or the other. This elongates the face and neck, and avoids your having multiple chins. If you look closely, you'll see celebrities doing this all the time. So...back to Adele as a role model. Above here she looks fabulously feminine. Hair is bouffant and away from her face, lending height and a slimmer look overall. Her sleeves are fitted, and cover her arms (always a tricky one for we full figured ladies), also lending a lean look to her frame. The colour and print are flattering and hide any figure faults admirably. She has ensured that the rest of her look is simple and pared down, to offset the busy print. The skirt of the dress is full and balances her silhouette perfectly. She wears high heels, with pointed toes and a low 'vamp' (that's where the top of the shoe sits), adding length to her legs. And she also poses perfectly, elbows out to give a pleasing line to her shape in the photo, and ankles crossed to slim her down. This look above, is my favourite though I think. The dress has simple lines, and slim sleeves, rendering her neat, classic and stylish. Although the neckline is high (not normally flattering on cuddly shapes), she carries it off by swooping that hair up into another gorgeous bouffant up-do, and topping it with a bit of soft frou-frou in the shape of a fascinator, to draw the eye upwards. She's kept other accessories to a bare minimum, or they're non-existent. The dress is the perfect length for her. Enough in the skirt to create the illusion of volume and height, and enough leg showing to enhance that illusion. Dark hosiery slims the legs. I daresay she's wearing heels to give her additional height too! The deep jewel colours are gorgeous against her alabaster skin. The fabric has a low sheen that just says 'luxury'. 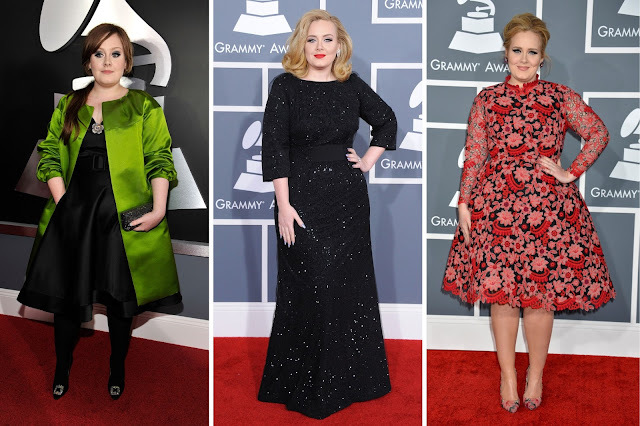 These are all little tricks that Christy can use to give her Adele style makeover a kick start. Very easily achieved, with minimal fuss. Adele is full figured with a rounder face. Nowadays she sports longer hair, no more flat pixie cuts, and either wears her hair loose, to slim her face, or swept into a variety of bouffant updos creating a taller, more slender shape overall. 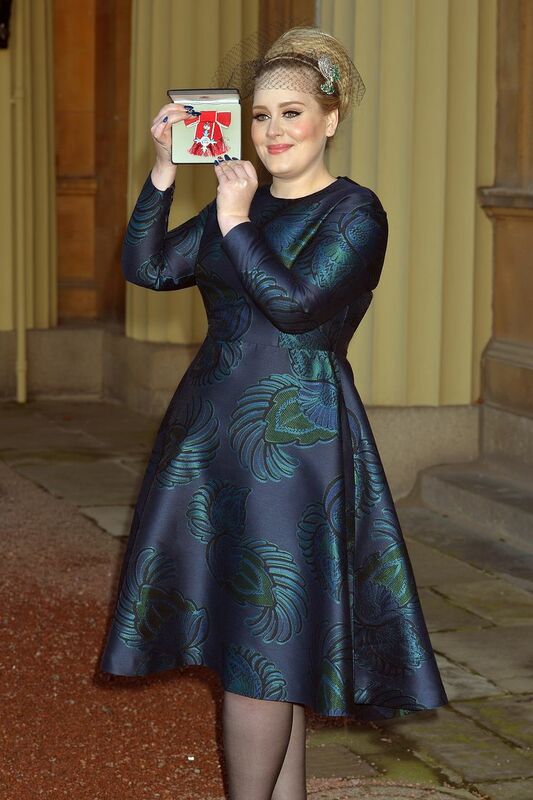 Adele wears heels with a low vamp, to lend height to her frame, length to her legs, and sophistication to her ensembles. She primarily wears fit and flare type dresses in flattering colours and prints, keeping all other accessories to a minimum. She can also be seen wearing casual ensembles featuring trim jeans or leggings, and sleek, minimalistic tunic tops with A-line coats, to streamline the extra bulk that Winter woollies create. Boots with a heel, again create that longer and leaner look, even for casual wear. She also frequently employs the monochromatic colour scheme to avoid dividing her silhouette, and does so with great success. She makes sure that her hair is a colour that flatters her looks. She wears her hair in different styles according to the mood she is trying to strike with her outfit. She emphasises her beautiful eyes with subtle eyeshadow, shading, eyeliner applied appropriately, and lots of mascara and/or false eyelashes. False eyelashes aren't just for dancers and models, you know! Her perfectly groomed eyebrows frame her eyes and give oomph to her pretty face. A box of Eyebrow dye costs around $20, lasts up to 20 applications, and can do the same for you. I love Adeles look too. I foresee some Adele days in my future as well Christy. Thanks! Who is your style idol? Wow, I'm just back from holidays and loving your work. I've been collecting some style and glamour books for the past few years. I started with one called Grace Kelly Style and then another one called simply Grace (about Grace Kelly) and both with stunning full page photos of her in her heyday. I've since bought 25 Dresses, Sophia Loren's biography with lots of photos, a Trinny and Susannah book and a few others. They are a great reference for people who want to emulate a bit of glamour. I love the Dior look of the 50's. A few years ago a purchased a black and white spot dress with cap sleeves, a ruched mid section and full skirt from an op shop for $6. The whole dress was lovely but not something I would be comfortable wearing so I removed the skirt and made it into a top to wear with black evening pants or skirt and wore it with pants and pearls to a wedding. My sister asked me where I bought the top and when I told her its history she rolled her eyes (not an op shop bone in her body) but six months later she asked if she could borrow it and has worn it a couple of times now. I would say my style is a mix of classic 50's and just classic. I'm not an out there person but I am someone who makes an effort and will honour the occasion appropriately. Loving this topic. I love love love Adele and can identify with her body shape and full face! Thanks for pointing out so many secrets for us to follow. I def. can't wear the flat hair, but I wish I could. I have to keep some height and layers and around my face to soften my meatball face! Your hair looks fabulous after the heated rollers have done their job. So do the different glasses. Hi Mimi, I've been reading along and not commenting because....well.....as you would know, dressing isn't my 'thing' and I don't care to make it my 'thing'. Nor do I wish to bring down the tone of your blog. But 'authentic'....that's my 'thing', so I will address that aspect of your makeover. Like you I am entering into a new phase of my life. My oldest child is effectively an adult. My younger one will be soon enough and I realise that the all consuming demands they placed on my time are lessening. I have always known that there were aspects of myself that I had to put on hold whilst I prioritised these short years of them being children and me affording them the childhood I wanted them to have. But now, I can 'unpack' some of the ME I put into storage when I became a Mum....knowing that one day I could be her again. So, as I don't care about how I look or dress I can't offer anything up there. I do care about writing and whilst I always kept writing, it was just anecdotes and tales of my parenting life. This year I will WRITE again. My novel has been sleeping for years and it needs to be awakened. I have enrolled in a writing course (something I never thought I would do, believing that if you can write, you can write) and will see what it is that I learn from that. I will take what is useful and consider more carefully what I think is not useful and I will amalgamate these things into what feels authentic to me. That's my kind of person. Not frocked up but authentic. Which is the point really. Loving this series. I find myself in need of a major overhaul. Having battled depression, caring for a severely injured husband, legal battles for his ongoing treatment, rearing children and everything life throws at you I am looking drab and showing the toll those hard years took. However thankfully times have eased, my husband is doing well, the kids are getting to the final years of high school, and I think it is time I cared for myself a little bit. I think you are looking fabulous. May I ask what brand the heated rollers are and where you got them from?